. : Nottinghamshire ASA | Brian Barnett’s Funeral :. The funeral of Brian Barnett will take place on Tuesday 25th October 12.30pm at Mansfield Crematorium. 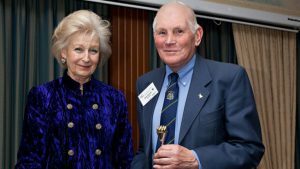 One of Brian’s most memorable days was when he was presented Her Royal Highness by Princess Alexandra with a Torch Trust award. Brian was nominated for the award by the ASA having volunteered with aquatics in Nottinghamshire for the past 32 years. He became interested in swimming when his son began to swim in 1972 and decided that he wanted to be more involved with his club, so he became a committee member and qualified as a swimming teacher, coach and lifeguard. Brian began his work at county level in 1985 when he joined the Nottinghamshire Amateur Swimming Association (ASA) Executive Committee. His experience and knowledge enabled him to successfully mentor and prepare many of our officials. He was also partly responsible for recognising that young swimmers needed a chance to swim competitively and so helped to organise skills and development galas. In 1989, Brian was awarded his County Blazer Badge for outstanding work, and in 1998 he became president of Nottinghamshire County ASA. Despite some serious health issues, he continued to volunteer his time, expert knowledge and generosity to both county and club.